Cards, Candi and Cupcakes: Clearly Besotted Challenge #2 - more spots! 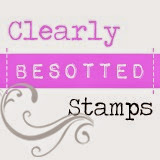 Back again, I actually had 3 cards to make last week for special people so used dots/spots in all so I could enter in challenge for my favourite stamps, just love the simplicity and clean crispness of Clerly Besotted Stamps, have quite a collection now, lol! Hope you like, even a little! this is an adorable tag...sweeet!